The Ultimate Valentine's Day Date Dress! Click here to watch Nick Verreos on TV Guide Fashion Wraps with Lisa Rinna. We are on the lookout for Project Runway Canada episodes online. Please let us know if you locate these anywhere. Meanwhile, "Project Catwalk" from The Netherlands is available here. Thank you Thomas! Click here for a CANDI Studios slideshow from Blayne Walsh's "Five Golden Rings" Fashion Show in Seattle. Thank you Jennifer. This Los Angeles Times article expresses how most Project Runway fans are feeling! 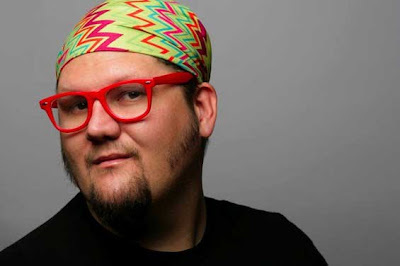 Don't miss this feature from Robert Lloyd and the latest installment of "Where are They Now." Joe Faris Benefit Fashion Show Tonight! Nina Garcia is working on a new book. Click here for a new interview with Kayne Gillaspie. Newsday sums up the status of Project Runway Season Six. Heidi Klum will appear on The Ellen DeGeneres Show on Monday, February 2nd. Click here to check your local listings. Thanks Nicole. Click here for a video interview with Korto Momolu from the Richmond Times-Dispatch. 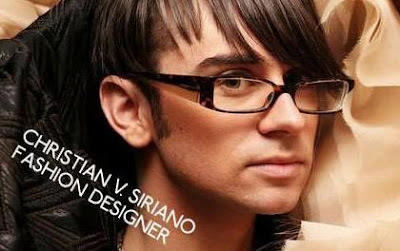 Christian Siriano will be at The University of Kentucky on February 5th. Click here for tickets. 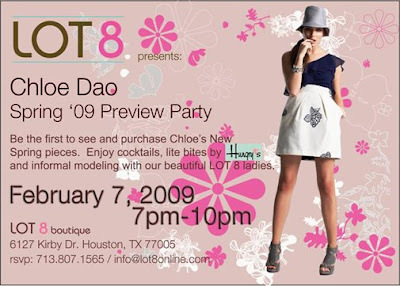 Attention Houston: Join the fun with Chloe Dao at Lot 8 on February 7th. Click here to RSVP and we would love a field report! Dance diva Sylvia Tosun wears a Malan Breton necklace in her new video scheduled to launch in February. Click here to read Laura Bennett's latest from The Daily Beast. Jay McCarroll's documentary "Eleven Minutes" hits screens on February 20th. Click here for more info. 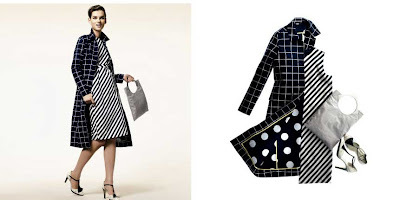 The new Liz Claiborne collection designed by Isaac Mizrahi launches in February. Honestly, I think it's adorable. The pink and white skirt would be perfect for Kaitlin and the black and white outfit is exactly my style. Click here for a slideshow. What do you think? 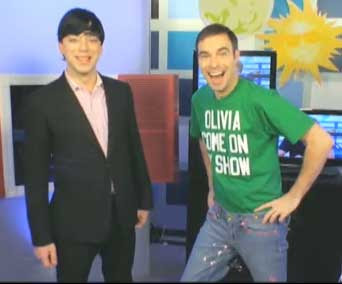 Malan Breton joins BPR Favorite, Jim Cantiello on this episode of "MTV Detox." The New York Post speculates about the season six runway show at Bryant Park. Christian Siriano will be on Fashion Police tonight critiquing SAG Awards Fashions. Thanks Ali. Rami Kashou's designs are on sale at Maneater Threads. Sadly, this website is folding so don't miss out on your chance to pick up a Rami Kashou! Katrina Bowden wore this charming Christian Siriano design to the SAG Awards yesterday. Click here for a new interview with Project Runway Canada's Iman. The High-schooler continues the countdown of his top ten favorite looks. 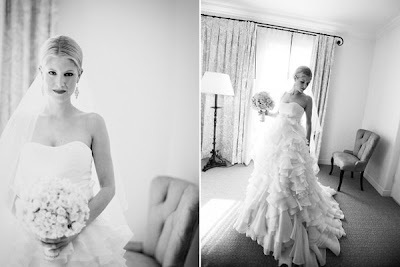 This gown was designed by Christian Siriano. Check out more photos here on the photographer's website. Christian Siriano has generously donated two tickets to his February 19th Bryant Park Show along with a "signature piece from the collection" to the lucky winner of this charity auction. 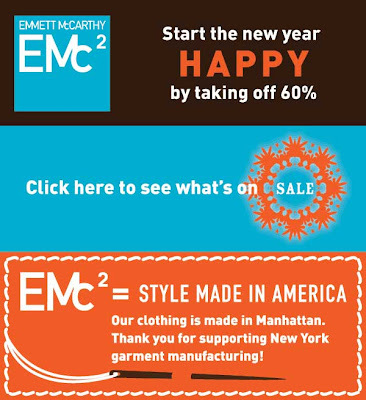 Proceeds will benefit The New York Restoration Project. Good luck to all and please let us know if you are the winner. Michael Kors is apparently very optimistic about the economy. He plans to open a brand new flagship store in London followed by 25 more across Europe in the next three years. Click here for the story. He is also launching new fragrances. Season Two of Project Runway Canada premieres on Tuesday and there is plenty of publicity. Click here for a new interview with Iman. Still hopeful about season six! Alison Kelly's "Dahl & Dane" t-shirt is featured in the February issue of Self magazine. Click here for "Project Iman." Click here for an interview with Project Runway Australia's Helen Manuell. The FIDM website has posted an item about Project Runway Season Six being filmed on campus. 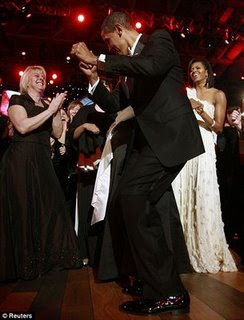 Laura Bennett and Jay McCarroll comment on Inaugural Fashion here in The Daily Beast. Attention Chicago: Terri Stevens will join other local reality stars tonight at RA Sushi. Click here for more information. Blayne Walsh's "Tom Ford for President" t-shirts are available here. The High-Schooler continues his Top Ten Countdown here. Just wanted to give you an update. Thank you for posting the info about the Curtis Granderson shoot out, it was for a great cause and I was so happy to be a part of it. First of all Curtis is the most genuine and nicest person I have met EVER! It was a lot of fun and Kid Rock came out to play, who BTW is also one of the nicest guys. Anyhow here are a few pix. Curtis served as referee and made sure everyone scored. Miss America Kirsten Haglund and Project Runway dude Joe Faris (who played basketball like you’d expect from someone on Project Runway) were allowed to shoot free throws until they made it. Leanne would like us to know that she was not a part of the Washington DC Fashion Show and she was not even invited to participate. Her Alma Mater (FIDM) purchased her finale collection and presented it in Washington. Here is the text of her comment and you can also read her blog entry here. I just wanted to express my frustration about this. This show went on with out any of my participation whatsoever. I wasn't invited, although it was made to sound like I put on this show. It's fine that they (FIDM) purchased these clothes, and they have the rights to do with them whatever they would like. But I REALLY cringe at the way they mixed up the separates. This is NOT how they should have been paired up at all, and it makes it a different collection completely. That's all. Sorry, I just had to vent. But I wanted to make it very clear that this show was not my doing at all! Thanks to everyone for your support, and I'm working hard on 2 new collections. Stay tuned! Here are a couple of items to entertain us while we wait to see what Michelle Obama will wear to the inauguration! The High-Schooler is counting down his "Top Ten" looks from all five seasons of Project Runway. Check out #10 here and #9 here. Do you agree with his choices? Leanne Marshall's collection was included in The Presidential Inaugural Luncheon and Fashion Show, hosted by the California State Society of Washington, DC, and the Fashion Institute of Design and Merchandising (FIDM). Nick Verreos showed his own "Inaugural Fashions" and also served as Master of Ceremonies. Click here for more information and a great slideshow. Keith Bryce prepares for his fashion show. 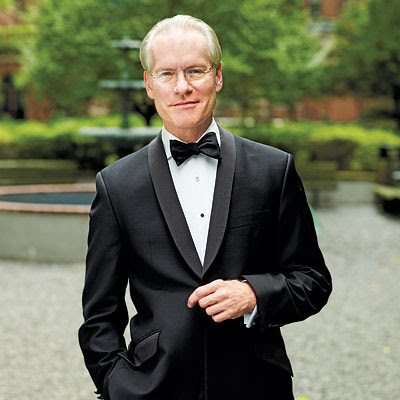 Click here to listen to Tim Gunn on Inaugural Fashion. Nick Verreos held a media preview in anticipation of the "California State Society Inaugural Luncheon and Fashion Show" in Washington. Click here for more. Thanks Marsha. Is winning Project Runway even a good thing? Click here for the answer. Project Runway Season Five designer Joe Faris was among the local celebrities playing basketball for a children's charity. Click here for more. 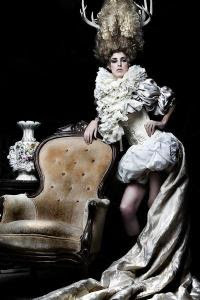 Keith Bryce has been busy preparing for a fashion show to coincide with The Sundance Film Festival. Click here for more information. BPR's Aussie friend Emma has posted a new interview with Project Runway Australia's Season One winner, Juli Grbac. From the Canadian edition, Evan Biddell has designed reusable shopping bags for Winners. Click here for the story. 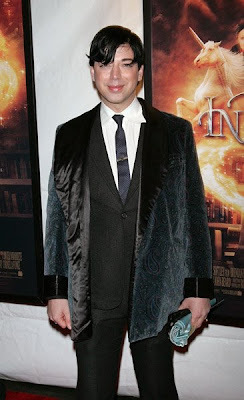 Malan Breton attended the New York premiere of Inkheart. Malan enjoyed the movie and recommends it for families with young children. 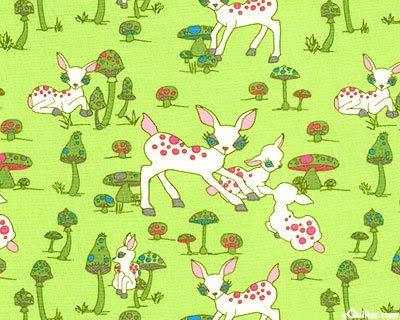 See Jay's new fabric lines and join the fun at the Stitch Party at Spool in Philadelphia, January 30 from 5:00 - 8:00. Click here for details. Thanks Cheryl. 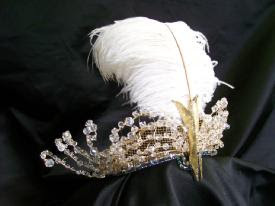 Project Runway Season One designer Austin Scarlett is among the celebrities who have created tiaras for an auction to benefit the young adult program at the New York Public Library. Also, volunteers are needed to help with this charity event. The Mercedes-Benz Fashion Week schedule has been posted and Project Runway is included in the usual Friday morning slot at 9:00 AM. Chicago Opera Vanguard, Chicago’s newest, hippest opera company, is proud to announce that Project Runway Season Four designer Steven Rosengard will design the costumes for the Chicago premiere of Ricky Ian Gordon’s "Orpheus and Euridice." 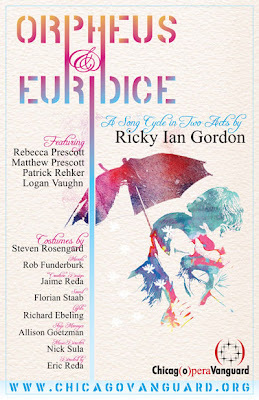 Orpheus and Euridice performs January 29 – February 8, 2009; Thursdays through Sundays at 8pm. All performances will be held at the AV-Aerie, 2000 W. Fulton St. General Admission is $20. Student Admission is $10. Tickets are available online at www.chicagovanguard.org. Project Runway Season Three model Nazri Segaro is featured in a new LG Incite phone ad. You can see her in the current issue (January 19th - page 65) of People magazine. Thanks Donna B and Romi. Christian Siriano is discussing Golden Globe Style on E! Fashion Police. Click here for times. Thanks Ali. Click here for the redesigned Project Runway Canada website. The premiere is on January 27th. Lucky for Canada! Sweet P weighs in on Golden Globe fashion for MTV.com. US Magazine has a poll for Heidi's Golden Globes look. Love it or hate it? Click here. They are calling it an 80's inspired Galliano. I think I'll trust Nick and David for the correct identification of the dress as vintage Galanos. Tune in to the TVGuide channel tonight for The Golden Globes Fashion Wrap with Lisa Rinna and Nick Verreos. The Heart Truth’s Red Dress Collection 2009 and is followed by Yigal Azrouёl, Duckie Brown, Charlotte Ronson, BCBGMAXAZRIA, Nicole Miller, This Day/Arise Magazine: African Fashion Collective 2009, Academy of Art University, Venexiana, Lacoste, Georges Chakra, Andy & Debb, ADAM, Barbie Runway Show™, Verrier, Monarchy, Lela Rose, Mara Hoffman, Nicholas K, Sergio Davila, Hervé Léger by Max Azria, Diane Von Furstenberg, Akiko Ogawa., Erin Fetherston, Miss Sixty, Farah Angsana, Carolina Herrera, Carlos Miele, Tracy Reese, Tony Cohen, Terexov, William Rast, Cynthia Steffe, Badgley Mischka, Matthew Williamson, Pamella Roland, Diesel Black Gold, Dennis Basso, Cho Cheng, MAX AZRIA, Tibi, J. Mendel, Nanette Lepore, Michael Kors, Richard Chai, 3.1 Phillip Lim, Alexandre Herchcovitch, Milly by Michelle Smith, Anna Sui, Tommy Hilfiger, Brian Reyes, Rebecca Taylor, Ports 1961, Custo Barcelona, Zac Posen, Project Runway and Tadashi Shoji. DKNY, Calvin Klein Men’s Collection, Y-3, Jill Stuart, Donna Karan New York, Yeohlee, Z Zegna, Calvin Klein Women’s Collection and Ralph Lauren are associate members on the official Mercedes-Benz Fashion Week calendar with shows off-site. Further details and announcements on this event will follow. The dress is vintage James Galanos - not Galliano. Elle.com profiles Leanne Marshall here. CraftSanity.com features a podcast with Daniel Vosovic. You can also enter to win a copy of Daniel's book, "Fashion Inside Out." Thanks Kelly. In a lawsuit unrelated to the Project Courtroom, a 2005 copyright suit was settled in favor of Heidi Klum and the other Project Runway producers. Read the story in WWD.com. Click here for a new interview with Leanne Marshall. Click here for a video of Tim Gunn commenting on Michelle Obama's style. Without any drama, Project Runway Canada has also switched networks. More news about Season Two of Project Runway Canada here. Thanks Sharon. Click here for some Fashion Week news. Click here for a pattern and instructions for a Jay McCarroll-designed tote bag. 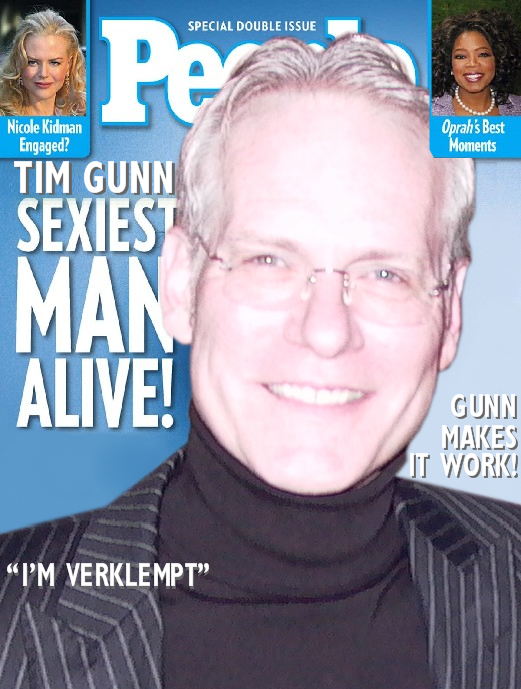 Thanks Cheryl S.
Finally, check out this Tim Gunn parody in The Onion. Thanks Kelly! 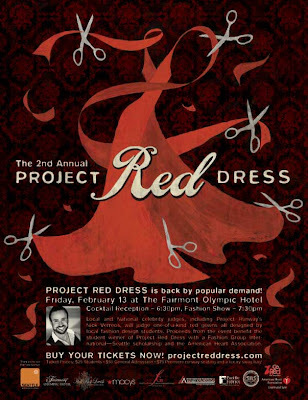 If things go as they have in the past, we should have the Project Runway Season Six Finale fashion show on Friday, February 20th at 9:00 AM. As of this minute the official Mercedes-Benz Fashion Week site has not yet posted the schedule, and yet we have persistent rumors that "Project Runway" will be there. Not much has happened with the Project Runway lawsuits lately. We still don't know which network the show will wind up on or when the sixth season, which was shot in L.A., will make airwaves. But the production team is plowing ahead as scheduled. Tim Gunn told us at the Geoffrey Beene YMA Fashion Scholarship Dinner at the Marriot Marquis last night that Runway is scheduled to film at Fashion Week on Friday, February 20. "I'm making my home visits to the finalists starting on Sunday," Gunn added. "It's an incredible season. It really is. And I just want people to see it. And I want the designers on the show to get the exposure." Us too. BPR friend, Julie Wolfson caught up with Jerell Scott at John Doe Jane Doe in Los Angeles. Click here for her story. 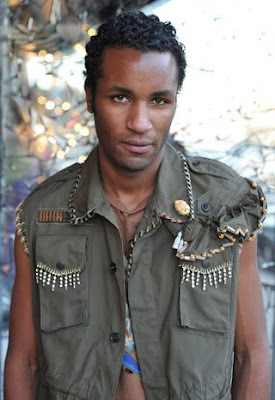 Project Runway Season Five Designer Suede is among the judges for the teen fashion design contest, "Sew Fabulous." Click here for more. Photographer Brad Walsh has taken some excellent new photos of Jack Mackenroth. Go shopping with Gretta Monahan here. Korto Momolu will be presenting a fashion show in Washington DC on January 17th. Click here for more. Nick Verreos is as busy as ever. Click here for updates. Not only is Project Runway nominated for a Producer's Guild Award, but Heidi Klum is nominated as well. The Awards are presented on January 24th. Good luck to our favorite show. 1. Who designed the dress that Nina Garcia wore to the Project Runway Season Five Finale? 2. Where was Nina born? 3. Nina got her start in the fashion industry working in Public Relations for which designer? 4. What is Nina's title at Marie Claire? 5. What was the first episode of Project Runway that Nina did not judge? Who replaced her? Please e-mail your answers to Team BPR. Thanks everyone! Season 1, episode 5: replaced by Anne Slowey, and Amsale. The Fashion Scholarship Fund has selected the eight finalists for its Geoffrey Beene National Scholarship Award and will announce the four Winners live at the 2009 FSF Geoffrey Beene Fashion Scholarship Dinner on January 7th at the New York Marriott Marquis Hotel. Each winner will receive a $25,000 scholarship award. Tim Gunn will be the host. Click here for the full press release. Click here for a new interview with Gretta Monahan from WWD. Please stay tuned to BPR for a Nina Garcia trivia contest later this afternoon. Click here to see the full line and to place your order. Paris Hilton ordered eleven versions of this dress because she liked it so much! Designed by Project Runway Season Five contestant Emily Brandle for her Smoke and Mirrors collection, the "Babe" mini dress will be offered at a huge discount on January 8th at Gomatta Girls. We'll post a reminder. Click here for Laura Bennett's latest column.